Literacy has been embedded into the construction area at Johnson House Preschool. Children have been creating signs to indicate the need for trucks to “Stop”, give way and also to follow the rules of the worksite. Educators have been working alongside the children, using digital technology as well as books to show the children the signs and give them the opportunity to create replicas. This helps to develop literacy skills in being able to interpret what the signs mean, write out the words and then use them during play. Children at Johnson House Preschool have enjoyed getting out onto the main lawn, playing some games and learning new skills at AFL. Physical activity gives children a chance to run around as fast as they can, getting the heart rate up and developing their big muscles. As they played games children used their imaginations to become animals and move their bodies in different ways. The children demonstrated they were paying attention by listening and by being able to follow simple directions. Physical activity also helps children to learn patience as they wait for their turn, or to have their ideas heard. 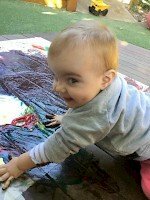 Murray house children continued to explore their senses through painting with their fingers. To give a different texture and feel to the paint, educators added a variety of materials to the paint. The children mixed the colours as they crawled around the paper and made lots of swirly marks on the paper. The paint turned gloopy and gooey and turned into a messy play experience. Some children discovered black as they mixed the three primary colours. Educators were fascinated to observe how much the children enjoyed their sensory exploration. At Murray House Toddlers, educators have been partnering with families to collect and introduce words from the many different languages spoken both in children’s homes and by Murray House staff. The children sang the new terms to an invented “Hello” and “Good morning” song, to the tune of “This old man” using a combination of Auslan signs and cultural gestures. The children heard, and were asked to try to say (and sing) “Hello” in Hindu (“Namaste”), Korean (“Ann Yeong”), Mandarin (“Ni Hao”) and in the Gadigal language (“Budyeri Kamaru”). It is important for children to hear their home languages spoken and see that they are valued at the centre. 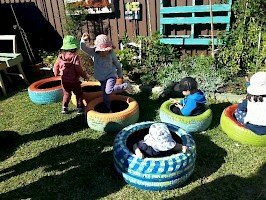 Last year’s Gorton Toddlers garden was an undoubted success, the garden provided the children with a sense of belonging & ownership, a desire to be a part of a process and in some individual cases, a bit of a boost to their self-esteem. It was only natural that a new garden should evolve, interest in the new garden peaked when children helped to pull the existing plants out. Several children began a dialogue based on how the plants’ absence had changed their perception of the space – with one child asking “why is the garden bigger now?” Children enjoyed smelling the plants, touching the leaves and learning about what plants were in season. 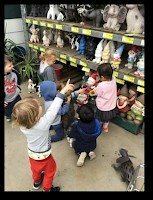 After picking some carrots, lettuce, chives, rosemary, broad beans, garlic and a native blueberry, the children enjoyed looking at some garden gnomes and garden dinosaurs! Toddler children at Rigby House enjoyed a game of Ring a Ring O’ Roses with their teacher, Elise. The children demonstrated happiness and enjoyment in playing this game with their friends. The game helped the children to learn to hold hands, and to move around in a circle, demonstrating their coordination and spatial skills. They demonstrated their great listening skills as they responded to the cues of the song, and anticipated with excitement the falling down and getting up actions. 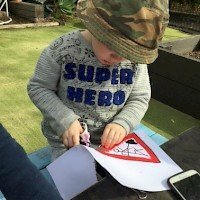 Randwick/South Sydney Family Day Care coordination staff and two educators took their children on an excursion to Windgap Cottage in Botany. The Windgap Foundation is a not for profit organisation providing services to people with intellectual disabilities. The clients were happy to show the children their goldfish, the scarecrows they were making, their mosaic work as well as the old tyres that they are painting to make garden beds for other Windgap centres. The children had fun playing in the tyres and spontaneously singing “Row, row, row your boat”. It was a wonderful opportunity to connect with this special sector in our community. At Lulu’s Family Day Care, the children were provided with a learning experience that enabled them to connect with natural and processed materials through their explorations of a sensory basket. Lulu had created a basket filled with a variety of natural items, which encouraged the children manipulate the resources and investigate how they felt, and the different sounds they made.